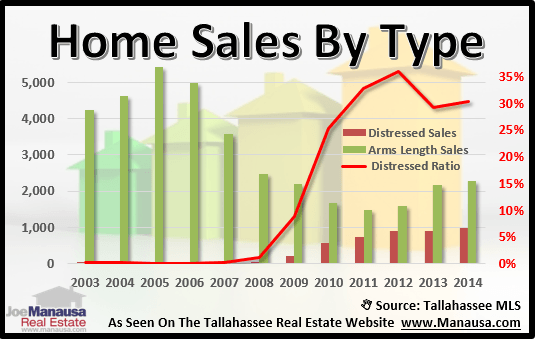 There is an interesting conflict developing for distressed home sales in Tallahassee. We are seeing roughly 30% of the homes selling each month come from short sales, foreclosures and bank owned properties, yet there are very few distressed listings entering the market. That means buyers are flocking to a smaller pool of these below market properties, and we will soon see some changes occurring in what is closing. Perhaps the big dip in buyer activity this summer can be blamed on the fewer offerings from short sale sellers. In the real estate graph below, we see both arms length home sales (green) and distressed homes sales (red) plotted and measured on the left vertical axis, while the overall percentage of distressed homes as a part of the whole market is shown as a red line and recorded on the right vertical axis. It certainly could be possible that the declining supply of distressed properties for sale could be impacting buyer activity. Historically, we see more contracts in the months of April through June than we have seen thus far in 2014, and several of our articles recently have recorded both the slowdown of buyers and the anticipated impact on closings in the months to come. The following list shows the most recently listed distressed properties in Tallahassee. These are just the ten newest properties, there are plenty more that you can find (updated twice each day) on our Tallahassee real estate property search tool. The key to buying a distressed property in Tallahassee lies in the preparation. If you are curious about these properties and go look at them without having all of your finances in order, it is not likely that you will bring about a successful home purchase. If you would like to know more about buying distressed property in Tallahassee, just drop me a note and we will schedule a time to help you prepare to make a very good purchase.